I have always preferred to keep quiet about my nightmares, some of which have come true, like Donald J. Trump’s presidency, or the fact that my dad is in deportation proceedings, or that my mom has a heart condition we cannot afford to cure. So I focus on my dreams instead, keeping my parents on my mind and in my heart as I advocate for a more just immigration system, and for better treatment for immigrants in general. Few things comfort me more than traveling down Denver’s Speer Boulevard, crossing the bluish-green bridges that span the highway, the river and the train tracks, looking down at the city I’ve called home since 2012. I look at the buildings downtown, and I feel free. They remind me of the first time I saw them, when I was 14 years old and had never seen a skyscraper except in the movies. The tallest structure I had ever encountered was only about six stories high. My family had come to Denver to take my grandmother to the bus station; where we lived, in rural Nebraska, there were no buses that could take her all the way back to Mexico. Today, as I drive down the boulevard, I spot a few bumper stickers that read, simply, “TRUMP,” or “NATIVE.” They remind me that some people boast a stronger claim to this land than I do. Still, Denver is home to at least 55,000 other undocumented immigrants, and sometimes that knowledge feels like the only thing centering my life at a moment when thousands are being deported — or under threat of it. 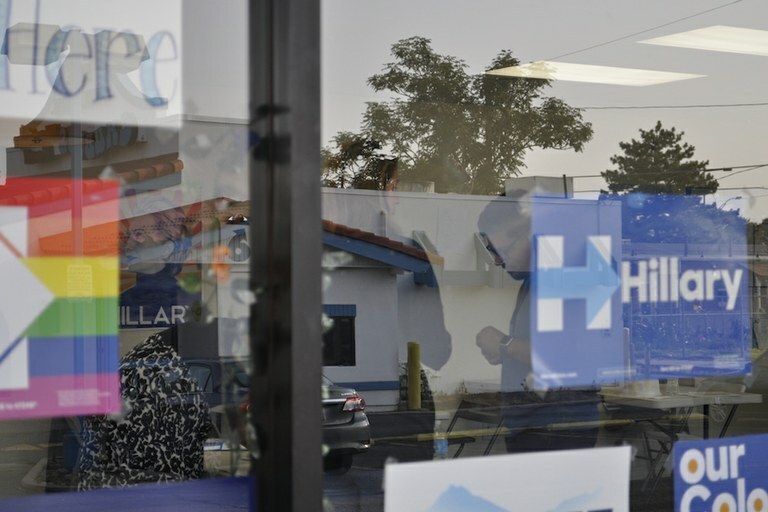 The reflection of Juan Gallegos is seen in the window of a Denver Hillary Clinton campaign office, for which he volunteered, during the 2016 presidential election. Thanks to the Deferred Action for Childhood Arrivals program (DACA), in 2013 I was able to get a two-year reprieve, and I have since renewed my status twice. For the past five years, I have been able to work lawfully under my real name — a dream scenario for anyone who arrived in this country illegally. I’m proud of the life I have built since I got a Social Security card; proud of my education at the University of Nebraska at Kearney, and the work I now do, helping immigrants to apply for citizenship and register to vote. Even though some people — including my president — may not want me here, I am thriving: I am living the American dream, and dedicating my life to public service through my job at a nonprofit organization. Through my work at the Colorado Immigrant Rights Coalition and the CIRC Action Fund, I’ve been able to help more than 3,000 people apply for naturalization. I often hope that the folks I’ve been able to assist with immigration paperwork will remember that I was there for them when they needed it, and that they will, in turn, vote for candidates who will help people like me become citizens, too. And then, when I am finally able to get in line and apply for citizenship, I hope to take the next step: to run for office and continue a life of public service, in a whole new way. 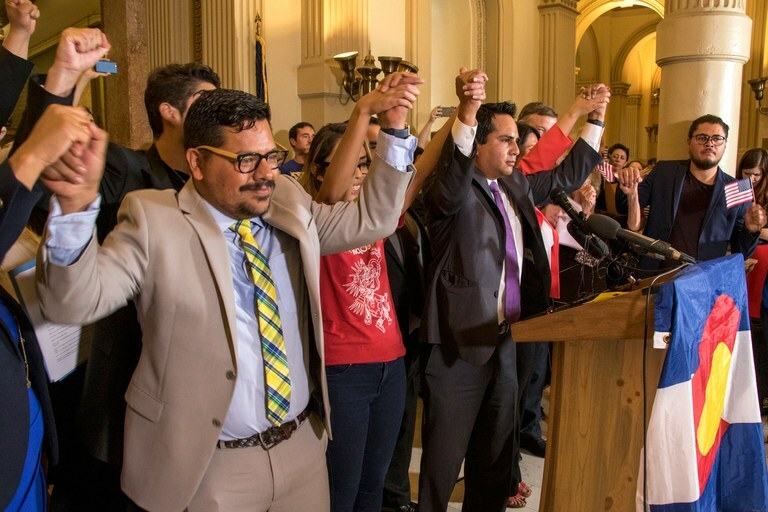 Juan Gallegos, left, holds hands with a chain of DREAMers during a press conference on the possible repeal of Deferred Action for Childhood Arrivals in 2017. I came to this country with very little: a backpack full of clothes and a head full of American dreams. As a 12-year-old, my first mission was to learn the English language and American culture; my second, to catch up with the rest of my peers when it came to schoolwork. After less than a year in the U.S., I got an A+ in math, so I was placed in pre-algebra; I also asked to be taken out of the English as a second language class and placed in a science class instead. I felt like I was “making it.” So, less than a year into my new life, despite my still-limited English skills, I decided to run for student body vice president at Hastings Middle School. I didn’t win. But I put up a good fight. One day, I will run for state office in Colorado. My friends and I joke that by the time I’m in my mid-40s, I’ll be a U.S. senator. But in order for that to happen, I’ll need to be able to apply for citizenship by the time I am 37. My prospects are grim: Right now, the only way for me to obtain lawful immigration status is to marry a U.S. citizen, but I haven’t yet fallen in love with the right person. The Dream Act proposal that’s currently in Congress would — if it passed tomorrow — allow me to obtain citizenship in 12 years’ time. But that bill has been debated over and over, without success, ever since it was first introduced in 2001 — the same year I came to this country. This March, I’ll turn 29. I have a whole life ahead of me, and yet, so much of it remains uncertain.